Want signs the music tech blogosphere is happening? How about a blog devoted to nothing other than the EMS Synthi, the classic, portable analog modular synth from the 70s used by the likes of Eno and Fripp? Pin writes to tell us of his new creation, which already has patches, specs, and sounds for the current or would-be EMS user. By the way, let’s just reflect on that for a moment: portable. Modular. Analog. I’m still waiting for a new modular electronic tool — that is, other than a laptop running Max or Reaktor. For those of you running the software, this could help inspire an integrated design. Good luck with the new blog, Pin, and keep us posted! 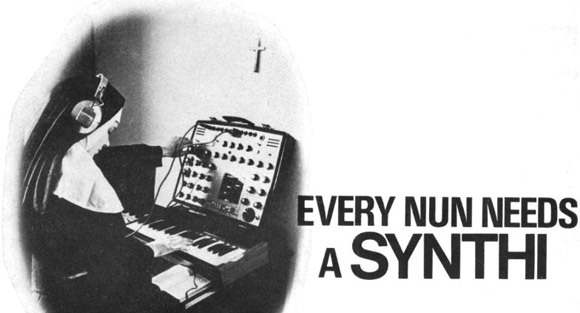 For more Synthi adverts, see Every Advert Needs a Synthi. I’d like to picnic with synths. Maybe this summer out on Jones Beach?